I was listening to the news this morning and heard the criticism of Governor Romney’s speech in Israel. I wondered what he had said that had caused the problem. The press reported that the Palestinians were upset because the Governor commented that the culture of Israel provides a fertile ground for economic prosperity. That statement really doesn’t seem all that offensive. I knew that the Governor had stated that Jerusalem was the capital of Israel, and wondered if that were the real source of the problem. Anyway, I went to Governor Romney’s campaign website to read the speech. The attacks on the speech are another example of the mainstream press’s “Look–a shiny object over here! Don’t look there!” campaign for President Obama. Governor Romney’s speech outlined some of the political and cultural ideas that have allowed both America and Israel to prosper. Those ideas included democracy, the rule of law, God-given rights, and free enterprise. I can understand how the Palestinians would be upset at these concepts–generally speaking, these are foreign ideas to all of the Arab countries in the region. One of the things that under-girds national prosperity is the rule of law as it applies to property rights. A man is less likely to improve his property if he does not own it. Also, property rights give the average citizen a means to acquire an asset that will increase in value (generally real estate increases in value) and gain some measure of wealth that he can pass on to his family. Another thing not mentioned in the Governor’s speech that plays a very important role in a nation’s prosperity is the use of all human resources. When a country excludes women from participating in the work force and excludes the voices of women from government, it decreases by half the flow of ideas and innovation into the economy and into the government. I am not saying that every woman should work or be involved in government, but I am saying that every woman who has something to contribute should be allowed to contribute it. The corrupt governments of the nations that surround Israel do not encourage prosperity for the average man. The well-connected steal the wealth of the country and the average citizen lives in poverty. The culture of respecting your fellow man and helping him become prosperous is not part of that society. That may be the biggest reason that the culture of Israel creates prosperity and the culture of the Arab nations surrounding Israel does not. John Hinderaker at Power Line posted an article yesterday about the press coverage of Governor Romney’s trip to Europe. When he was interviewed by the British press, the Governor stated (in true CEO fashion) that he was concerned about some of the logistics issues surrounding the Olympics. He was soundly criticized by the British press for even implying that things might not be perfectly planned out. Although that statement has turned out to be accurate, there have been no apologies from the press or comments from the press stating that what he said turned out to be true. The Governor then traveled to Israel where he was met with cheers (and raised $1 million from contributors). The press reported how upset the Palestinians were about his comments that the Israeli culture provides a fertile ground for economic prosperity. It was all intended to demonstrate he was ready to handle foreign affairs smoothly and lead during dangerous times. Instead, as he made his final stop of a three-nation tour in Poland late Monday, Republicans and Democrats alike were shaking their heads in the U.S. Though Republicans said they saw no lasting harm, Democrats raised questions about Romney’s ability to handle delicate topics with sensitivity on foreign soil, even under the friendliest conditions. Any resemblance between what actually happened and what AP reported is purely coincidental. It really is a shame that the American press has forgotten that it is supposed to supply voters with accurate information–particularly during an election season. On August 1, business owners must change their health insurance offerings to include abortion-inducing drugs, contraception, and sterilization services. Just last Friday, a judge in Colorado gave one business’s owners the first glimmer of hope that their religious freedom may survive this attack. On Saturday I reported the story of Hercules Industries (rightwinggranny.com). The owners of the company went to court because the mandate to provide abortion-inducing drugs, contraception, and sterilization services violated their religious beliefs. The court has halted the implementation of that part of Obamacare that would violate the religious beliefs of the company’s owners until the court case is settled. If we value our religious freedom as Americans, we need to vote for people in November who will repeal Obamacare. Who Is Vetting These People ? Last week we saw the media (and John McCain) attack Michele Bachmann for requesting an investigation of the influence of Muslim Brotherhood in Washington, D. C. Breitbart.com posted an interesting article last week on some of the more obvious problems with the Muslim Brotherhood and its relationship to Washington. The article at Breitbart cites the case of Louay Safi, a Syrian-American Islamic leader who has been actively involved with groups close to the Obama White House. Safi himself has been fairly influential in government circles. For several years, he was only one of two endorsing agents for the Pentagon’s Muslim military chaplain program as Director of Leadership Development for the Islamic Society of North America (ISNA). He was also responsible for teaching about Islam to American troops deploying to Afghanistan and Iraq. It should be noted that the Islamic Society of North America (ISNA) was named as an unindicted co-conspirator in the Holy Land Foundation (HLF) Trial (the largest terrorism financing trial in American history) in 2008. Thanks to the HLF trial, it is now public knowledge that nearly every major Muslim organization in the United States is actually controlled by the MB (Muslim Brotherhood) or a derivative organization. Consequently, most of the Muslim-American groups of any prominence in America are now known to be, as a matter of fact, hostile to the United States and its Constitution. So it was particularly curious last year when Safi reappeared last August as the director of the political office of the newly-formed Syrian National Council (SNC). His profile appears on the SNC’s website, and pictures taken at the unveiling of the SNC in Istanbul shows Safi front and center of the leadership. His new SNC role and his connections to the U.S. Muslim Brotherhood were first reported by the Global Muslim Brotherhood Daily Report. But what is the relationship between the SNC and the Syrian Muslim Brotherhood, historically one of the most violent Muslim Brotherhood offshoots in the world? The Syrian Muslim Brotherhood and its Islamist allies have complete control of the SNC–as testified to in multiple media reports, including the New York Times and the Washington Post. Michele Bachmann is correct in questioning ties between the Muslim Brotherhood and those in power in Washington, D. C. The rest of us should be asking those same questions. PJ Media posted an article yesterday about a book by Stanley Kurtz called Spreading the Wealth: How Obama is Robbing the Suburbs to Pay for the Cities. The book exposes President Obama’s plans for his second term. Using Alinskyite measures and tactics meant to deceive, they implement policies that go over the heads of an unaware public who does not realize what is going on. You create the new social policy by bypassing Congress and hiding the measures in other programs — such as the stimulus, in which educational policy was included without any debate. All of these measures were discussed in a major White House conference held on July 18, 2011, at an event not covered by the press and never given any publicity. Featuring Obama’s old mentor Kruglik, the movement to destroy the suburbs as the way to transform America by redistributing tax monies to the cities was the very topic of discussion. It is part of programs such as the Sustainable Communities Initiative, and to be run through the group set up by Kruglik, Building One America. Please read the entire article to see who the advisers are and what they believe. I would also strongly recommend reading the book. We really cannot afford four more years of President Obama. Mayor Bloomberg is at it again. The New York Post reported yesterday that the Mayor is asking New York City hospitals to lock up the baby formula so that more mothers will breast-feed their babies. I support breast-feeding. I think it is a good idea. All my children were breast-fed and all my grandchildren were breast-fed. There is a history of milk allergies in my family and that seemed like a logical preventative measure. It seems to have worked. However, forcing women to do something they may not want to do because the Mayor thinks it’s healthy is a horrible idea. What if Mayor Bloomberg wakes up one morning and decides we should all eat seaweed for a week? Where will he draw the line? I have no problem encouraging new mothers to breast-feed their babies. In 1970, when my first daughter was born, I was the only breast-feeding mother in the hospital. By 1974, when my third daughter was born, there were more babies breast-fed than formula-fed. I think the way to get mothers to breast-feed their children is to give them as much information as possible about the benefits. The new mothers are the ones who need to make the choice–not the government. Paul Mirengoff at Power Line posted an interesting article yesterday about the omission of a moment of silence at the Olympics for the Israeli athletes murdered 40 years ago. This is not a small thing. Two of the widows met with Rogge and asked that their husbands and the nine other athletes murdered be remembered at the Olympics. …According to their account, when asked whether his decision was “because [the murder victims] were Israelis,” Rogge didn’t answer. He’s right, I fear — the “voice of the world” probably was, as ever, against Israel. The IOC’s values are not the values of America, at least not yet. But they are the values of the many other international organizations that seek, with the help of American leftists, to take more and more control of our lives and our fate. 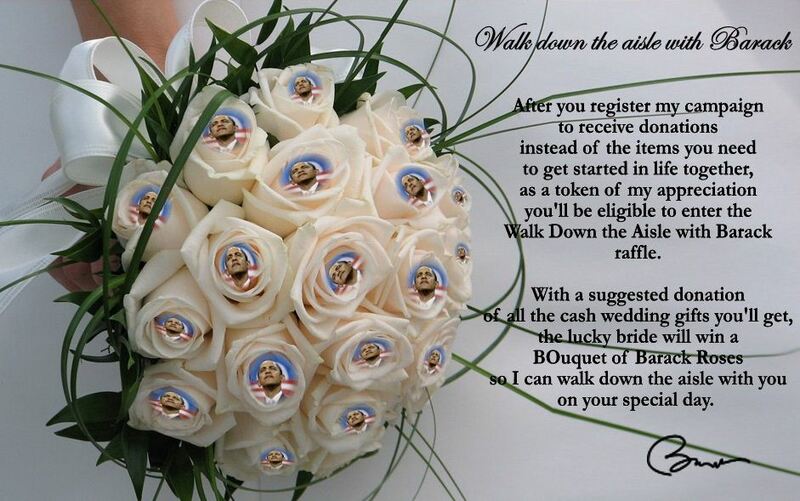 Unless we want one day to be in the position of those hapless Israeli widows, begging for favor before a French bureaucrat (or worse), we must cede nothing more to these bodies. In August 2008, in the early days of this blog (rightwinggranny.com), I posted an article about surface stations–the measuring devices used to calculate changes in the earth’s temperature. The article linked to a website called surface stations.org, which posted pictures of various surface stations used to measure global temperatures. 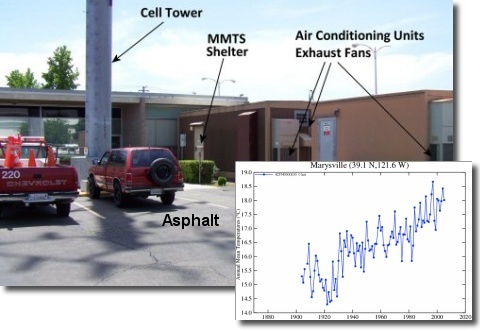 The location of the air conditioning exhaust and the cell tower might have something to do with how the temperature at this particular surface station seems to be increasing. Well, a few years later, a scientific type (which I am definitely not) has done further research. I am not a scientific type. I do not claim to fully understand what I have read in this article or even what is shown by the pictures. I strongly suggest that you follow the link to WattsUpWithThat and read the article for yourself. I am pretty good at bottom lines, though, and the bottom line here seems to be that global warming is not happening at the frightening rate that we have been told it is happening. We can now all take a deep breath and continue on with life as we know it. I strongly suggest that we do try to be stewards of our beautiful planet, but I also strongly suggest that we don’t overreact to the fear mongering that has been going on in recent years. In 1975 Newsweek warned us of the “Coming Ice Age.” Now we are warned of the global warming catastrophe. I think we can safely conclude that scientists really don’t know as much as they think they do. THIS IS NOT REAL!! THE PROBLEM IS THAT IT COULD BE! There is a possibility that the First Amendment (free speech, religious freedom, etc.) may actually be upheld in the courts. The Blaze reported yesterday that a Federal court has upheld a lawsuit against the controversial contraception mandate, filed by Catholic-owned employer Hercules Industries. On Wednesday I posted an article about Hercules Industries and their right to reflect their religious beliefs in their corporate policies. The Justice Department denied them that right and they have appealed to the Tenth Circuit Court of Appeals, which covers Colorado. A federal court issued an order Friday that halts enforcement of the Obama administration’s abortion pill mandate against a Colorado family-owned business while an Alliance Defending Freedom lawsuit challenging the mandate continues in court. …Alliance Defending Freedom attorneys obtained the first-ever order against the mandate on behalf of Hercules Industries and the Catholic family that owns it. The administration opposed the order, arguing, contrary to the U.S. Constitution, that people of faith forfeit their religious liberty once they engage in business. The decision only applies to the company, and the court emphasized the ruling did not apply nationwide. This is good news. Federal judges had dismissed two other lawsuits against the contraception mandate. The decision of the Tenth Circuit to hear this case will eventually bring this matter before the Supreme Court regardless of what the ruling by the Tenth Circuit is. Exactly What Does ‘Paying Down The Debt’ Mean ? 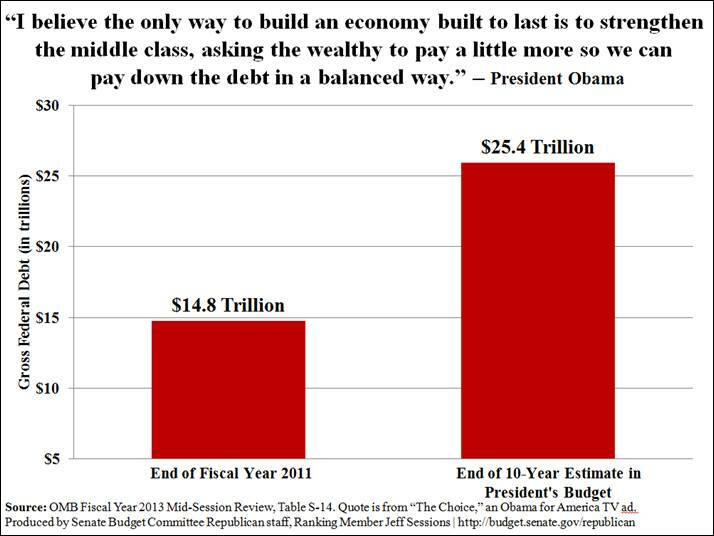 John Hinderaker at Power Line posted an article yesterday about President Obama’s claim that he plans to pay down the debt in a balanced fashion–increasing taxes on the wealthy to increase revenue and reduce the deficit. Aside from the fact that it is historically proven that raising taxes does not increase revenue, there are some definite problems with that approach. 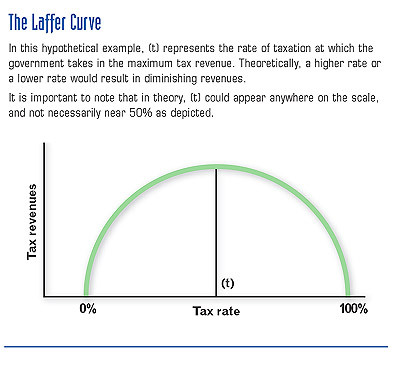 As the illustration states, 50% is not necessarily the ‘magic number’–that number could be anywhere. The best real life illustration of this principle is the migration of millionaires out of Maryland after the tax on millionaires was increased (see rightwinggranny.com). People who will be impacted by large tax increases on the upper middle class (no–they are not ‘the rich’) usually have the means to shelter their wealth from the tax man (check out the financial disclosure statements of some of the Kennedy’s running for office). 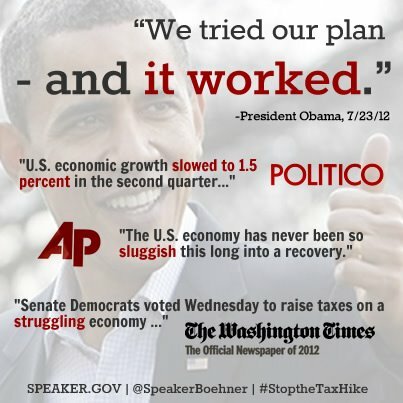 As voters, we need to be aware of the consequences of another four years of President Obama’s economic policies. Yesterday Breitbart.com posted an article some of the inner connections between Jon Corzine and the Obama Administration. Today’s Wall Street Journal (this is a subscriber only article) is reporting that MF Global Holdings Ltd. shifted hundreds of millions of dollars in customer funds to its own brokerage accounts in the days before its bankruptcy filing. That is illegal. However, there are no signs of a serious investigation into exactly what was done at MF Global or what Jon Corzine’s involvement was in whatever was done. How come? …the now-defunct MF Global was a client of Attorney General Eric Holder and Assistant Attorney General Lanny Breuer’s former law firm, Covington & Burling. Records also reveal that MF Global’s trustee for the Chapter 11 bankruptcy retained as its general bankruptcy counsel Morrison & Foerester–the very law firm from which Associate Attorney General Tony West came to DOJ. This doesn’t sound as if we will ever get to the truth. However, there is hope. At least 65 members of Congress have already signed a letter to Attorney General Eric Holder requesting that he appoint a special prosecutor to investigate MF Global’s collapse and the loss of $1.6 billion in customer money. What’s more, even progressives have begun to wonder whether Holder’s Covington & Burling connection explains why the Department of Justice has not charged, prosecuted, or jailed a single Wall Street executive after the biggest financial collapse in American history. I am not sure who the current Department of Justice is currently representing, but I have a feeling that it is not the average American. On Sunday I posted an article about the Obama Administration’s attack on Frank VanderSloot, a major donor to Governor Romney’s presidential campaign (rightwinggranny.com). Now the Obama campaign has turned its focus to Jack Gilchrist of Gilchrist Metal Fabricating of Hudson, New Hampshire. The New Hampshire businessman (Jack Gilchrist) who appears in a Mitt Romney television ad accusing President Barack Obama of “demonizing” small business owners has gone to his local police after receiving two “harassing” telephone calls and, he says, hundreds of nasty emails. 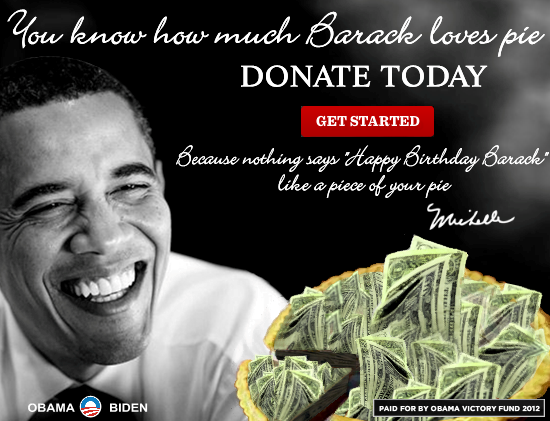 The Obama campaign is getting out of hand. But two profanity-laced telephone calls prompted Gilchrist to call the Hudson police. Gilchrist emailed what he said were the voice mails to UnionLeader.com on Thursday. One called him a “vile piece of (expletive),” among other things, and demanded he call Obama to apologize. This sort of activity has no place in a presidential campaign. Why Are They Always After My Cheeseburger ? Human beings have canine teeth, which are designed for eating meat. Why do these people think they should control our diets and determine what we eat when? Rahm Emanuel left his job in Washington working for President Obama to run for mayor of Chicago. He won the election and is now the mayor of Chicago. The relationship between Mayor Emanuel and President Obama was considered to be a close one of political allies and friends. The Weekly Standard is reporting today that Mayor Emanuel is planning to block Chick-fil-A from opening its restaurants in Chicago. The values Mayor Emanuel is referring to are the Bible-based Christian values of the owner of Chick-fil-A. The owner does not support gay marriage. Evidently, if you speak out about your Christian beliefs, you are not welcome to do business in Chicago. Many of the Jews who owned the homes, the apartments in the black community, we considered them bloodsuckers because they took from our community and built their community but didn’t offer anything back to our community. Ignoring Nation of Islam leader Louis Farrakhan’s history of anti-Semitic remarks, Mayor Rahm Emanuel on Wednesday welcomed the army of men dispatched to the streets by Farrakhan to stop the violence in Chicago neighborhoods. And Mussolini kept the trains running on time. Today’s Washington Free Beacon posted a story with some background information on the recent fires in Colorado. Robert Zubrin, a senior fellow at the Center for Security Policy and President of the aerospace engineering research and development firm Pioneer Astronautics, blamed environmentalists for the spread of these fires. “They facilitated the spread of fire by keeping people from logging, adding firebreaks, and using pesticides,” he said. Zubrin wrote a book on this subject, Merchants of Despair: Radical Environmentalists, Criminal Pseudo-Scientists, and the Fatal Cult of Antihumanism, which he will present today at the American Enterprise Institute. Zubrin recently wrote that climate change does not explain these fires. “The culprits here … have not been humans, but Western Pine Beetles,” he wrote, which turned “over 60 million acres of formerly evergreen pine forests into dead red tinder, dry ammunition” for fires. One of the things that would prevent this type of wildfire would be permitting logging in these forests to clean out the dead trees and underbrush. “Logging as part of a program of rational forest management” could decrease the risk of fire by “thinning out mature trees that are the pine beetles’ major targets,” and creating “gaps between forests, to act as firebreaks and beetle-breaks,” he said. If “you turn that wood into furniture, it doesn’t turn into CO2,” Zubrin said. Green activists “don’t care if a billion tons of wood turns into CO2,” so long as people are not responsible. Environmentalists, of course, dispute this claim, stating that the Western Pine Beetles are doing the job of thinning the forests. Just for the record, I would like to note that the beetles are not doing a very effective job. “We do a firebreak on all jobs,” he said. As part of his logging, Moore even clears out landing zones for helicopters and action zones for firefighters. Conservatives do not support dirty air and dirty water–what we do support is introducing common sense to environmentalism. The Blaze reported today on the story of Amanda Clayton. Amanda Clayton was discovered in March to have been collecting welfare checks despite having won $735,000 as a lottery prize. This woman was collecting food stamps after winning the lottery! Attorney Todd Flood says Clayton has repaid the approximately $5,500 in food aid and medical benefits she received. The 24-year-old pleaded no contest to fraud last month and was sentenced on Tuesday. The Michigan Department of Human Services says Clayton didn’t inform the state about her pre-tax lottery windfall of $735,000 last year. Flood says Clayton did make an attempt but decided not to fight the case and move on with her life. Gov. Rick Snyder signed a law in April that requires lottery officials to tell the Department of Human Services about new winners. So where does Clayton go from here? Her attorney says that because she’s a felon, it’s going to be hard. “It’s Michigan in 2012. It’s difficult to find a job. A felony conviction is a very serious matter,” Clayton’s attorney told USA Today. We don’t have a poverty problem–we have an attitude problem! Since finding a job is going to be difficult after a felony conviction, has she considered renting out one of her two houses in order to provide a stream of income. I am sure that with a qualified financial advisor she could actually live quite comfortably on her winnings and rental income. Townhall.com posted an article today about Hercules Industries, a Colorado-based corporation, a business owned and operated by the Newland family, that manufactures heating, ventilation and air-conditioning equipment. The Newlands believe the morality the Catholic faith teaches them must animate their lives not only within the walls of the churches they attend, but literally everywhere else, as well — in the way they deal with their families, their neighbors and, yes, their business. The Newlands sued to protect their free exercise of religion in this regard because Health and Human Services Secretary Kathleen Sebelius issued a regulation, under the Obamacare law, that requires virtually all health care plans to cover — without cost-sharing — sterilizations, artificial contraception and abortifacients. In response to the Newlands’ complaint that ordering them to violate the teachings of the Catholic Church in the way they run their business is a violation of their First Amendment right to the free exercise of religion, the Obama administration told the federal court that a private business has no protection under the First Amendment’s free exercise clause — especially if the business is incorporated. “It is well established that a corporation and its owners are wholly separate entities, and the Court should not permit the Newlands to eliminate that legal separation to impose their personal religious beliefs on the corporate entity or its employees,” said the Justice Department. The message here is very simple. You are free to practice your religion in your church. The government will no longer allow you to exercise your beliefs anywhere outside of that church building. This is a far cry from the early days of America when churches were routinely meeting in the Senate and House of Representatives and public prayer by elected officials was accepted and expected. The attack on the First Amendment rights of religious people is one of the main characteristics of Obamacare. Obamacare needs to go away as quickly as possible! Today’s Richmond Times-Dispatch (Richmond, Virginia) posted an article about a Washington-based nonprofit group called Voter Participation Center which is sending voter registration forms to Virginia residents. Sounds like a good idea–a major election is coming up, let’s get out the vote. However, there is a slight problem–the voter registration forms are being sent to deceased relatives, children, family pets and others ineligible to vote. The organization has been mass-mailing the forms — pre-populated with key information such as names and addresses — to primarily Democratic-leaning voting blocs such as young adults, unmarried women, African-Americans and Latinos. Citing a Sunday Richmond Times-Dispatch story that brought the mailings to light, the letter also asks the State Board of Elections to require registrars to reject all pre-populated voter registration applications from the group and review the eligibility of all Virginians who have registered in the past two months. Now we all know how the major media will report this (if they report it at all). The story line will be that the Romney campaign is attempting to suppress the vote. Yes, they are. They are attempting to suppress the vote of dead people, children, family pets, and other groups not eligible to vote. Justin Riemer, the State Board of Elections’ deputy secretary, said forms have been sent by the group to deceased infants, out-of-state family members, and non-U.S. citizens, among others. Anyone who promotes voter fraud needs to remember that (aside from the legal aspect) voter fraud makes everyone’s vote count less–even the people perpetrating the fraud. This story is based on two articles–one posted at The Blaze on Tuesday and one posted at Hot Air on Tuesday. The article at The Blaze reports that the Jim Henson company will be donating its profits from its partnership with Chick-fil- A to the Gay and Lesbian Alliance Against Defamation (GLAAD). The two companies were in discussions about a deal to include muppet toys in children’s’ meals at the restaurant. That won’t be happening. All of this is in response to Chick-fil-A’s owners making a statement that they support traditional marriage. Chick-fil-A’s stand on marriage is not news to anyone familiar with the company. They are simply practicing their First Amendment rights. Unfortunately, Boston and Chicago are attempting to ban the restaurant from their cities because of that stand. National Review posted an article today about the Obama Administration’s support of the DISCLOSE Act. The DISCLOSE Act seeks unprecedented disclosures from private individuals, organizations, and corporations as the price of participating in public debate. But the administration and its congressional allies hardly need a statute to make public participation in civic life difficult for private citizens. The Obama Campaign and the Democratic Senatorial Campaign Committee have filed complaints against a major conservative social-welfare organization, Crossroads GPS, arguing it should be required to disclose it donors. Even worse, the IRS has responded to dozens of tax-exemption applications by tea-party groups with astonishingly intrusive document demands, seeking not only donor lists but also lists of volunteers. It’s a sad reality of our decayed political discourse that too many dissenting citizens face similar dangers even today. Since 2008, we’ve seen intimidation of religious organizations, death threats, and extreme economic reprisals after disclosures of financial support for allegedly offensive causes. In recent months, formerly anonymous bloggers have been targeted for “SWATings” (where someone calls the police to fraudulently report a violent crime at a person’s home, resulting in a potentially dangerous police intervention). And frivolous lawsuits against controversial speakers have become so common that more than 20 states have adopted protective legislation. No doubt the Obama administration would condemn the intimidation tactics its reckless “transparency” efforts enable. Yet the government still bears responsibility for the harm that results. The Supreme Court recognized this simple concept: “It is only after the initial exertion of state power . . . that private action takes hold.” In other words, without the government-mandated disclosure, bad actors would be on a tighter rein and have fewer targets. Please note. My name is nowhere on this blog. The domain name is registered to someone other than myself. That was the agreement I made with my husband and children when I started the blog–they were afraid of repercussions if I said anything that upset anyone. They did not want to see some crazed political zealot attack a little old lady. I tend to share that opinion and thus went along with their request. Generally transparency is a good idea, but when it endangers people who speak out, it needs to be stopped. See rightwinggranny.com for the story of Frank VanderSloot, a major contributor to Mitt Romney‘s campaign. His is an example of government intimidation of a donor in a political campaign.